We love the idea of living a simpler life, a life that's more manageable, more meaningful, and more rewarding. But simplicity isn't just about living a minimalist lifestyle or getting rid of things. 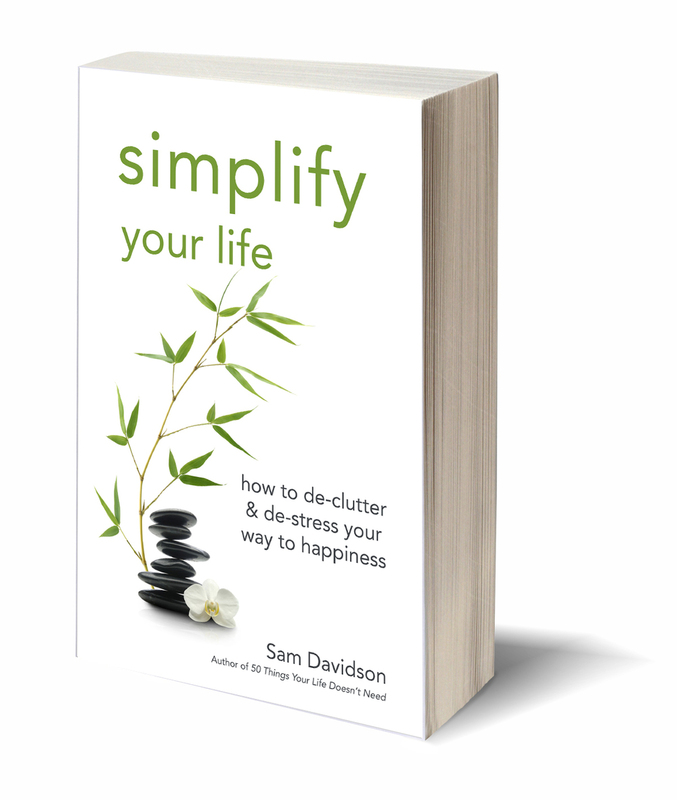 In Simplify Your Life, Sam Davidson offers timely tips and personal anecdotes to help you simplify your life by discovering what really matters. Using proven methods, the latest ideas, and easy-to-remember step-by-step plans, this book encourages you to find what brings you happiness and then helps you find ways to make room for more of it. Learn to de-clutter and prioritize your life to stay balanced and stress-free, all by discovering how to make things simpler. This book doesn’t change your life – it helps you find it, reorganize it, and inspires you to begin living it! Sam Davidson has given us a blueprint to look inward, find our passion, and go out and change the world. Sam Davidson fulfills his mission to help you reflect on life’s biggest questions, clear the clutter in your life, and make room for what really matters. Sam Davidson is the kind of person who can tell you the truth without hurting your feelings. And he’s the kind of writer who inspires you to let go of stuff you don’t need, be it old dreams or even older t-shirts, in order to make room for what really matters: your passion. Sam has an extraordinary ability to make people see the world in a different way. This book can help anyone find what’s important and begin to build a life around it. Sam Davidson helps remind us what real success in life means. Sam’s passion leads us to discover our passions and to live well, with meaning. How can we live passionately when we are still fooled by the myth that “more is more”? Sam Davidson invites us to free ourselves from oppressive layers of stuff and, in the process, let our lives breathe more fully. Using a method that helped him find his life’s passion – and then create his life’s work – Sam Davidson doesn’t simply offer a checklist of things to get rid of, but rather offers a way for the reader to ask himself or herself the hard questions needed to focus on finding and living one’s passion. 50 Things Your Life Doesn’t Need will help you get rid of what doesn’t matter so you can focus on what does. Sam Davidson writes with soul, heart and passion in 50 Things Your Life Doesn’t Need. More than just a practical list, Sam fulfills his mission to help you reflect on life’s biggest questions, clear the clutter in your life, and make room for what really matters. From bottled water to bad wine to boring hobbies, 50 Things will help you stop collecting and start living. I hate books on passion. But, I loved Sam’s book. Too much talk about finding your passion simply hides the passion we seek. We do too much thinking about ourselves rather than living ourselves. Having just retired from teaching where someone paid me to live my passion, I needed this book to help me discover my new dreams. Pitching 50 unneeded things creates space where I can glimpse the new man I am yet to become. I appreciate the call to courage to live into the hints of passion that are whispering me forward. A wise book for people longing to fully live. Sam has an extraordinary ability to make people see the world in a different way. 50 Things isn’t just another great read – it will change your life. Seriously, you need this book. Sam is trying to save the world and now he is trying to save your life. 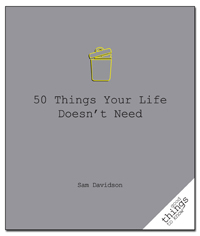 In 50 Things Your Life Doesn’t Need, Sam goes through our lives bit by bit, finding things that we can all live without. And by following his easy every day solutions to our man-made problems, you can live a happier, and much more fulfilling life. This is an absolute “must read” for anyone who dreams big but stays put, overwhelmed by the enormity of discovering and fulfilling your passions. Instead of offering regurgitated “step-by-step” lesson plans, Sam Davidson’s 50 Things are not only applicable to the simplicity of daily life but also force you outside your comfort zone into a place of uncertainty that compels you to find your place in this world. In a consumption driven economy like ours, where every man women and child is constantly being told to “be more, buy more, get more” it is more than refreshing to read Sam Davidson’s 50 Things Your Life Doesn’t Need. Between Gen Y/Millennial’s coming up, looking for a different set of rules to play by, and the Boomers coming down, wondering how they got fooled into believing that buying more junk would make them happy, there’s a real potential to launch a consumer powered economy, where philanthropy becomes how you live your life, and how you choose to spend your money, everyday. This book could well become a manifesto of sorts—a liberating tract to open the door to a vital and compelling review of what is really important in life. In a culture obsessed with the quick fix based on adding the latest-greatest, 50 Things’ encouragements of simplification are a breath of fresh air and something with which I really connect. “What do I value?” Good insight that leads people toward living passionate and intentional lives. Well, that and a people-to-plate ratio of 3:30. So, while I might own more plates than I can eat off of and I can’t imagine ever letting go of analog (there’s good documentation that technology hates me), thanks to this book, I’m already making notes of other changes in my life I can make to keep my passion sharply focused. 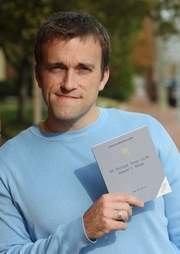 Thanks for writing a book that puts the questions before us that we all need to ask ourselves, but don’t. And, Sam–come over for dinner anytime. I’ve got lots of plates. President and Founder of Sweet Sleep, Inc.
Sam has hit on something important with 50 Things Your Life Doesn’t Need. Filling your life with material stuff is a distraction. But filling your life and work with meaning – although much harder – is well worth it. This book can help anyone find what’s important and begin to build a life around it. Sam Davidson helps remind us what real success in life means with 50 Things. This will become a must read for all of the aspiring entrepreneurs I work with who want more out of life than just building material wealth. Sam has managed, in just fifty, deftly crafted expressions, to sum up the secret to a meaningful life. 50 Things Your Life Doesn’t Need is a treasure chest of contemporary wit and wisdom, a Poor Richard’s Almanac for our time. The man who wrote, “Cheese and salty meat should be sparingly eat” would smile at Davidson’s advice to take a pass on the ”extra cheese, only indulge when it’s worth it.” We all need reminders of what we already know, namely that moderation, kindness and, above all passion, matter a great deal. A great book to give to someone you care about. 50 Things Your Life Doesn’t Need is your compass to living a passionate life. Read this book now and than give it to a friend. The world needs more passionate people. 50 Things is THE coup d’etat of conventional life; a resounding snap-of-the-fingers that wakes us from our daze and enables us to start living a life bubbling over with richness. Not only about “stuff”, Sam’s book provides worthwhile advice about prioritizing our mindsets and actions, while eliciting that subtle burning feeling we get in our chests when we get truly passionate – so much so that you’ll want to slam the book closed and run out the door to conquer the world…if you can put it down. They’re funny, they’re memorable, they’re so true. Sam’s 50 things are a much needed smack in the face for anyone looking to truly live life. 50 Things Your Life Doesn’t Need turns the traditional discussion of living a life of passion on its head. It breaks through the clutter and gets you asking the right questions to start your journey. A must read for anyone looking to live life a little deeper. Founder, Jubilee Craft Beer Co.
Sam reminds us that life is indeed short and with each poignant admonition underscores that a high performance life is skillful editing of mental clutter. This is an insightful, masterfully composed guidebook on living simply and passionately. These days, amidst the constant swirl of information, instant connectivity, and ‘stuff’ to buy and do, it is easy to feel lost, lacking in purpose, and ironically, disconnected. Sam’s book has helped me to realize and remember what is important in my own life, and to focus on it. One of the most delightful things about this book is the positive way it helps identify negative items and flips them into opportunities. One of my favorites is #12 Pictures that don’t mean anything. Part of living an artful life includes recognizing that your home is your gallery. Each object should carry a story of how it was curated, this personal provenance of objects is so much more meaningful than something produced from mass duplication. If you keep this book for your library shelf, be sure you have a story to tell about where it came from. These simple encouragements left me excited about my life as it is and highlighted areas where simplification would lead to a richer, more meaningful life. Our ability to live in the now is so at risk when the world tells us that our happiness lies in the next purchase. Davidson’s compilation challenges my lifestyle to be more simple and much richer. Sam has put together a “field manual” for doing life more abundantly. His passion leads us to discover our passions and to live well, with meaning. How can we live passionately when we are still fooled by the myth that “more is more”? Out of this miasma of misdirection comes a fresh word from Sam Davidson, who invites us to free ourselves from oppressive layers of stuff and, in the process, let our lives breathe more fully. These are not mere insights from a wise young sage; they are do-able acts that take little energy and, in the long run, increase your delight for life. Sam Davidson’s short sentences are explosives. Reading them you blast your way to the things that are real in your life. Because a lot of your stuff is nothing but props in a fake dream. You don’t need this book, but you need to face the questions it raises. Sam Davidson is one of the great social minds of our time. He has the unique ability to help individuals, non-profits and corporations alike connect with the social movement in our society and to make our world better. Sam’s new book is a must read for everyone who wants to make the most of their life. We must clear away the “stuff” of life that clutters and consumes in order to embrace our passion – to live the life we were meant to live. I am so thankful for Sam’s own passion and the way he uses his gifts to make a difference in the lives of so many. A practical and prophetic perspective on authenticity and passion. If more people choose to live this way, we might just be able to change the world. Sam’s first book, New Day Revolution: How to Save the World in 24 Hours has been dubbed “The Gen Y Bible on instigating change.” With over 100 small ways to make a difference – as well as topical interviews with real-life world changers – the book is your field guide for making a difference in your local community. New Day Revolution shows you how small changes in your daily routine can make a big difference. Next time you throw out the juice carton, take five seconds to compact it and save space in the landfill, or grab an extra box of crayons for your local school when you buy a box for your child. For people who feel they have little time, this first book from the duo that launched CoolPeopleCare.org gives helpful hints, practical tips, and step by step instructions on how to make a big difference in the local community and the world at-large with whatever time you have. We can’t all be Jack Bauer, running down bad guys and defusing bombs – but we can all make an impact where we are with what we’ve got.